This area of Norfolk is filled with narrow lanes, and ‘chocolate box’ villages with duck filled streams and babbling brooks running through the middle. An ideal and welcome break from the horrors of what was witnessed in the skies of occupied Europe all those years ago. Travelling away from Great Massingham and West Raynham, we carry on east, toward Norwich and then take a left turn and head north. Cutting through the delights of Norfolk, we take in the last few sites that offer good examples of airfield architecture. Before reaching our first sight however, turn off the main road at Weasenham St. Peter, for here is a small reminder of the terrible tragedies of war. Nestled in the village is a small but poignant reminder of the dangers faced by the young men who flew in our skies. 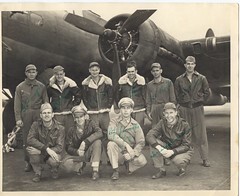 Once over friendly territory, crews would often feel safe knowing that ‘home’ was but a few miles away. However, for many the danger was not over yet. 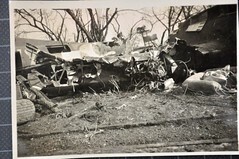 A pyramid memorial in this quiet and almost insignificant village, identifies the crews of not one but three aircraft that crashed close by killing all onboard. From this point you can see the hangars of West Raynham dominating the skyline, an indication of how close to home these young men were. 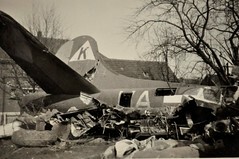 Blenheim L8800, of 114 sqn RAF, crashed on 5th June 1942. On board were: Sg. F. Cooke, Sgt. J Wallbridge (VR) and Sgt. E. Kitcher (VR) all of whom lost their lives. On 17th October that year, a B25 Mitchell, FL206 of 98 sqn RAF, crashed killing the crew: Flt. Sgt. D. Tanner, Sgt. E. Boreham, Sgt. L. Horton and LAC F Barnett all of RAF(VR). Finally on May 22nd 1943, close to his spot a Douglas Boston III, AL285 of 342 ‘Lorraine’ Sqn. crashed killing all her crew, who were part of the Free French Air Force: Lt. M. Le Bivic, Lt. R. Jacquinot, Sgt. L. Cohen and Cpl. J. Desertlaux. 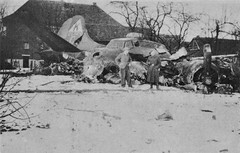 All three aircraft were based at nearby West Raynham when the tragedies struck. 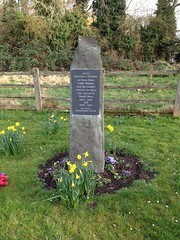 The memorial at Weasenham St. Peter. Behind you, are the not so distant hangars of RAF West Raynham. When leaving here, return to the main road and head east to our first stop at Foulsham. Foulsham, like many of its counterparts in this region played a major part in the electronic war, monitoring and jamming radar transmissions for larger formations of bombers. Despite this important and ground breaking role, Foulsham had only a short operational existence. 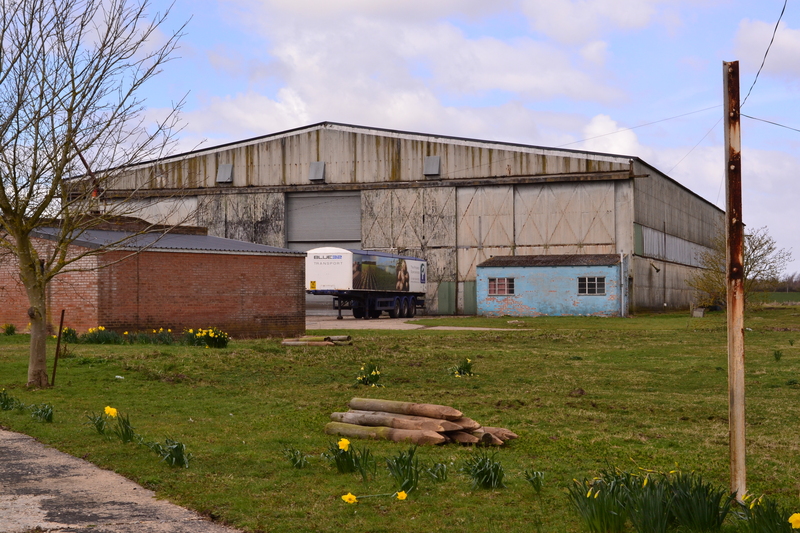 Built in the latter parts of 1941, Foulsham had three runways, 37 dispersals and 9 hangars. It was initially opened with light bombers of 2 Group Bomber Command. These were primarily Mitchell IIs of 98, 180 and 320 squadrons; 320 being formed entirely of Dutch personnel. A detachment of Glider storage and maintenance personnel from 12 GMS were also at Foulsham between April 1943 and March 1944 preparing and maintaining Horsas for the forthcoming Normandy invasion. In this same year, on September 1st, 3 Group Bomber Command took over responsibility of Foulsham and the much heavier Lancasters of 1678 HCU (Heavy Conversion Unit) and 514 Squadron arrived for operational duties over Europe. One month later, the American 375th Servicing Squadron (SS) arrived and began modifying de Havilland’s ‘Wonder Wonder’ the Mosquito, for photographic reconnaissance duties, a role the Mosquito excelled at. One of four T2 hangars. Once more, Foulsham changed hands and it became part of the now familiar 100 Group, who were dominating this area of the country. 192 squadron arrived with a variety of aircraft, the HP Halifax, Mosquito, Anson and Wellington for electronic warfare operations. Other squadrons soon joined them, and Foulsham became a large operational base shrouded in secrecy. Between 1943 and post conflict in 1946, more Wellingtons, Mosquitos, P38 ‘Lightnings’, Stirlings and Halifax IIIs arrived all becoming common place in the skies over Foulsham as they gathered information, trialed radio and electronic jamming operations and evaluated new methods of electronic warfare. Foulsham was further graced in 1944 with the installation of FIDO, the fog clearing system, a method designed to burn away sufficient amounts of fog to enable a safe landing in difficult conditions; not always successfully. However, despite all this, Foulsham’s operational life was soon to be cut short and in June 1946 it was closed to flying duties, whereupon it became the final resting ground for a large number of Mosquitos prior to scrapping. Foulsham remained ‘in-service’ until 1955 with the US Army, and then in the hands of the MOD until deemed surplus to requirements, it was finally sold off in the 1980s and its doors closed for the last and final time. A workshop nestled between two refurbished T2s. Many of Foulsham’s buildings have surprisingly withstood the test of time. Whilst the runways have all but gone, now farm tracks and tree lines, some of the buildings do still remain and even from the roadside, you can see what must have been a remarkable place during its short, but hectic life. 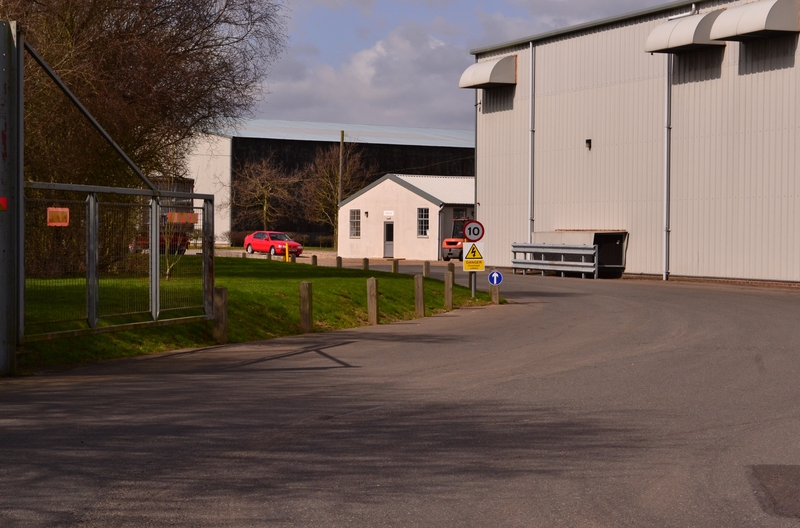 The road passes along the eastern side of the airfield, here, you can still see a number of the original T2 hangars, 3 in total, now utilised by a local potato business. 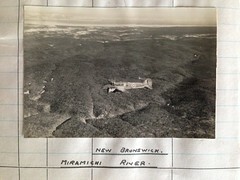 (‘Addison Farm’ as it is aptly named, is in recognition of Air Vice Marshall Edward Barker Addison, the only person to Command 100 Group*2 during the war). 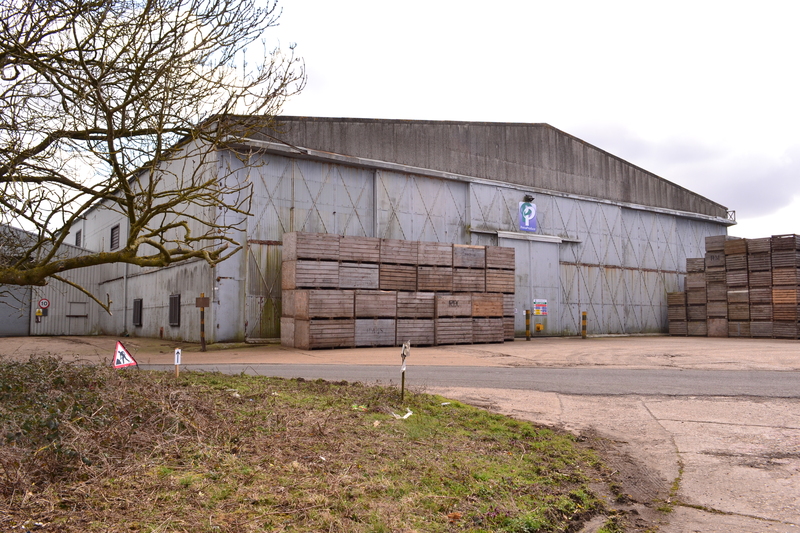 Whilst two of these hangars have been re-clad, the third is still in its original metal. Hidden amongst these structures, are some of the original technical buildings, again some refurbished some original. The mass concrete bases signify the manoeuvring areas linking this area to the main section of the airfield to the west. At this point, there was until recently, gates separating the dispersal area to the east (now farm dwellings) to the hangar area on your left. 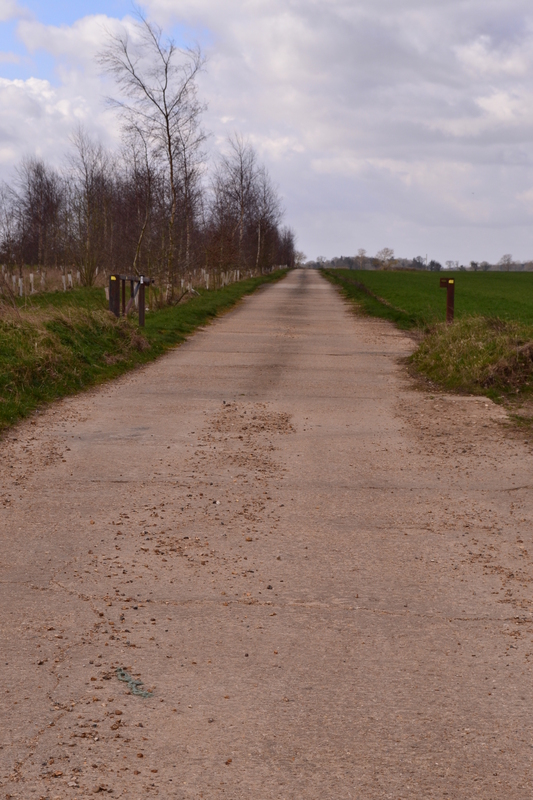 During the War, this road was surprisingly open to the public and aircraft would be manoeuvred across the road, traffic being halted by an RAF Policeman. Further to the north, beyond this area passing an air raid shelter, is the original entrance and further technical area. 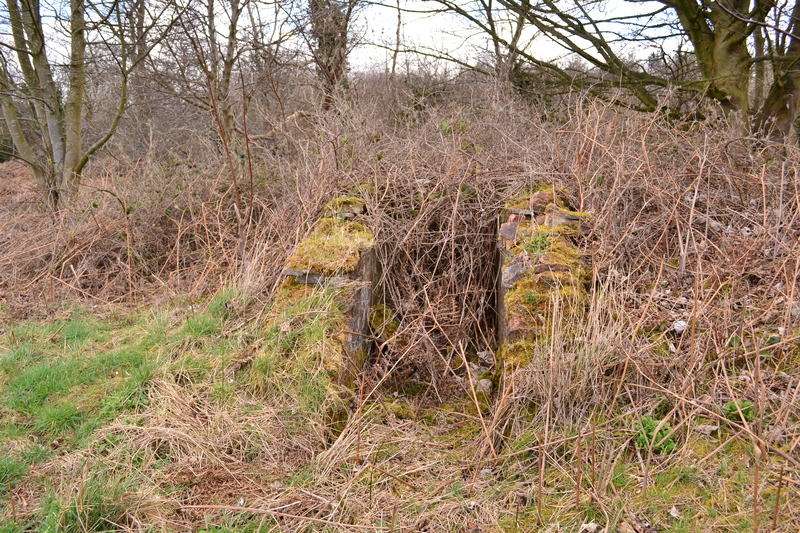 A pill-box, marks where the main entrance was. Turn left here and follow the road west. To your right you pass the original Fire Tender shed, a B1 hangar and other minor buildings in varying states of disrepair. To your left, a further T2, partially refurbished partially original. 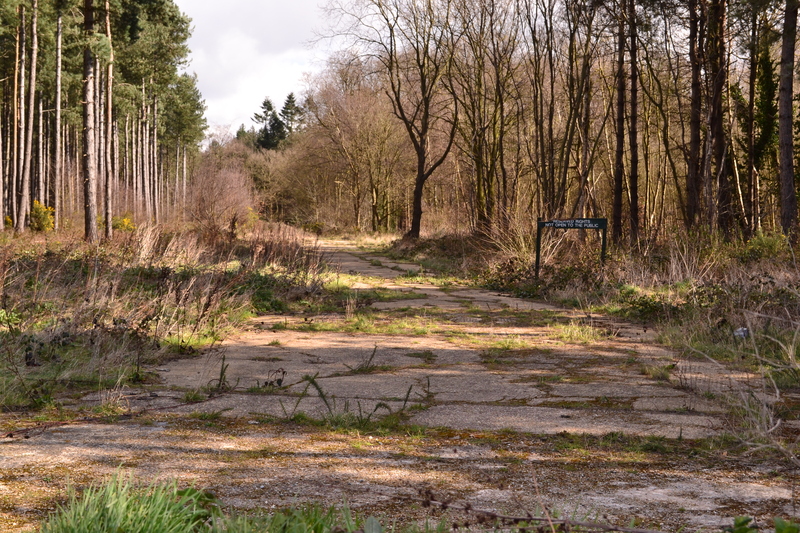 Further along, the road crosses the original N/S runway, full width remnants to the right and a tree-lined track to the left mark clearly where the enormous concrete structure was laid. The road ahead, is the where the 08/26 runway ran as it disappears over the brow of the hill. The road then turns away north leaving the runway and airfield behind you. The original Fire Tender shed. 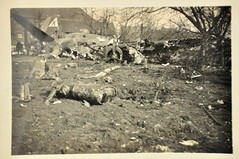 As with all airfields, the accommodation blocks and bomb stores were scattered well away from the main airfield. With some searching, evidence of these may be found amongst the hedges and trees, public roads utilising the concrete sections of RAF road laid down originally. Whilst the main layout of Foulsham is difficult to see from the road, the last remaining buildings have fared quite well and remain some of the better examples of original wartime architecture. There is a distinct ‘feel’ to the site that transforms you back in time to the days when heavy bombers and lighter twin-engined aircraft would rumble along its runways. Recent and ongoing development work by the farmer seems to be sympathetic and ‘in tune’ with the site, many buildings being reclaimed from nature and now ‘on show’ to the passing public. Whilst all are on private land, they are easily seen and it seems that there may be a winning formula here that other land owners could quite easily follow and preserve what is left of our disappearing heritage. The remains of the 08/26 runway. In the nearby village of Foulsham, beneath the village sign, stands a memorial to the crews and personnel of RAF Foulsham. From Foulsham, we head north-west, to a little airfield with the quaint name ‘Little Snoring’. Little Snoring is as its name suggests, a quiet hamlet deep in the heart of Norfolk. Surrounded by beautiful countryside, it boasts a superb round towered church (another called St. Andrew’s) that holds a remarkable little gem of historical significance. 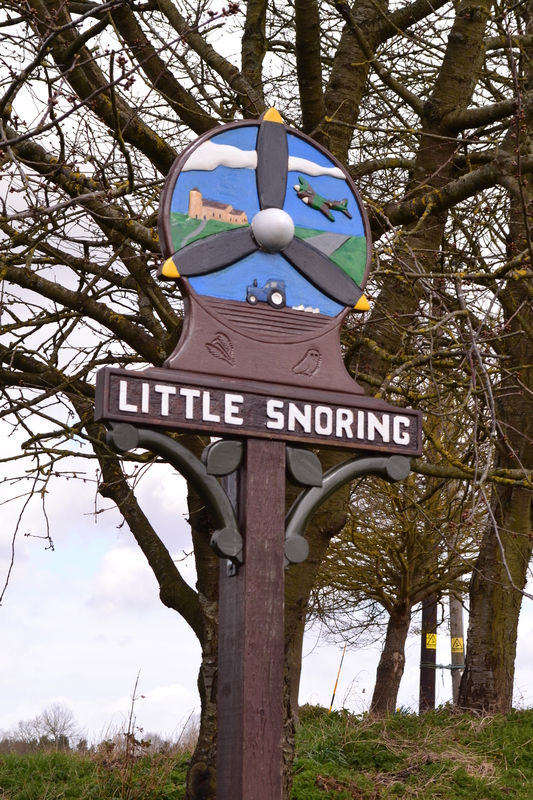 The Village sign shows Little Snoring’s aviation history. The airfield, to the North East, was originally opened in 1943, late in the war, as a satellite for nearby Foulsham. It had three runways: 2 constructed of concrete 4,199 ft (1,280 m) in length, (01/19 and 13/31) and one 07/25 of 6,004 ft (1,830 m) again in concrete. As with other airfields it was a typical ‘A’ shape, with 36 dispersal sites, a bomb site to the north, fuel dump to the south and the accommodation blocks dispersed away from the airfield to the east. It was built to accommodate 1,807 RAF and 361 WAAF personnel housed over eight domestic sites. Initially under the command of 3 Group Bomber Command, it housed the rare Bristol Hercules engined Lancaster IIs of 1678 HCU (Heavy Conversion Unit) and 115 squadron, (between August and November 1943) formally RAF Witchford (Trail 11) and East Wretham, who were to carry out night bombing duties, a role it had performed well at Witchford. Then, as with many of the airfields in this location, it was taken over by Addison’s 100 Group and Mosquitos moved in. One of two original T2 hangars still in use today. 169 squadron operating both Mosquito IIs and Beaufighter VIs, would undertake night fighter missions between December 1943 and June 1944. Like their counterparts at Great Massingham, Foulsham, North Creake, West Raynham and Sculthorpe amongst others, they would take part in electronic warfare and counter measures against enemy fighter operations. 100 Group, investigated a wide range of devises suitable for tracking, homing in on or jamming enemy radars. With a wide rage of names; “Airborne Cigar”, “Jostle”, “Mandrel”, “Airborne Grocer”, “Carpet” and “Piperack”, they used both “Serrate” and “ASH” to attack the enemy on their own airfield at night before they could intercept the bombers. A road leads to one of the dispersed accommodation sites. 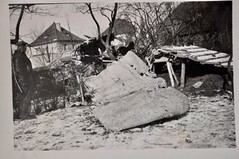 After a short spell with an American Intruder detachment between March and April 1944 flying P-51s and P-38s, Little Snoring was itself the subject of an attack from Luftwaffe aircraft that had followed the bomber stream home. The attack was so successful that Little Snoring was put out of action for some considerable time. Night intruder missions continued, with 515 squadron, 23 squadron and 141 squadron operating a range of twin-engined aircraft such as the Beaufighter IIf, Blenheim V, Mosquito II, FB.VI and NF.30. Radar training also continued using smaller aircraft such as the Defiant, Anson and Airspeed Oxfords of 1692 Flt. Eventually in September 1945, operational flying officially ceased and the airfield was reduced to care and maintenance. Like other airfields in this area, it became the storage area for surplus Mosquitos on their way to a sad ending under the choppers blade. Then in the 1950s Little Snoring was opened temporarily and used by a civilian operated anti-aircraft co-operation unit, flying Spitfire XVI, Mosquito TT.35 and Vampire FB.Vs. Finally in April 1953, Little Snoring was shut, the gates locked and the site sold off. However, that was not the of flying. Now in civilian hands, Little Snoring operates a small flying club and a microlight manufacturer. Aircraft can visit, and occasionally a ‘fly-in’ happens and the site springs into life once more. 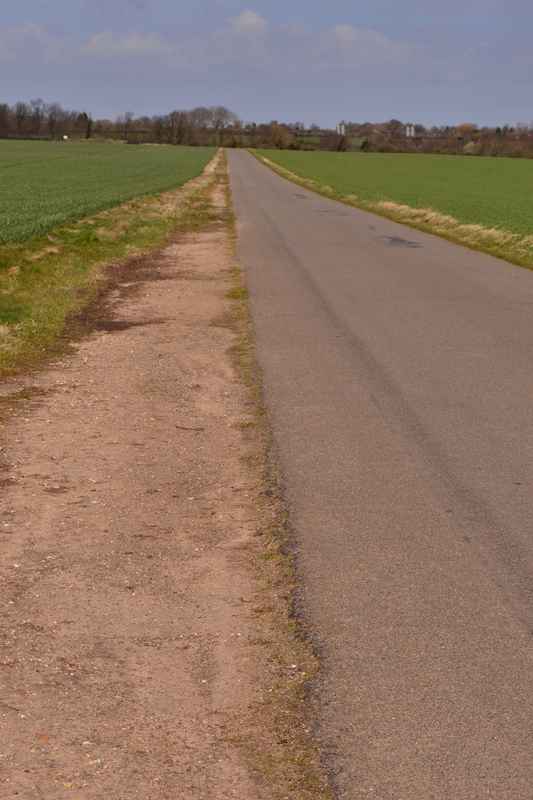 The road uses the former eastern perimeter track, part of which is still visible to the side. Following sale of the site, a large number of buildings were demolished or taken away for use elsewhere. The officers’ mess housed four ornately and beautifully written honours and awards boards. Luckily, these were saved by a good samaritan and now reside in the base’s ‘official’ church, St. Andrew’s, on the west wall. Written in paint, they detail the awards and ‘kills’ of the various crew members stationed at Little Snoring. Just a short walk from the church is the village sign which depicts a Mosquito, often seen over the skies of Little Snoring all those years ago. The perimeter track to the east is now the road, the accommodation site on the eastern side still bears the track but is closed off, what secrets it must hold! A few remnants of concrete roadway exist outside of the airfield, the northern threshold of the main runway is also there used to store gravel and other road material. A small number of buildings, mainly huts, exist in private gardens used as storage sheds. The local caravan site has what is believed to be the base hospital and / or mortuary now a washing block. The largest and best preserved buildings are two of the original T2 hangars, both used to store potatoes. 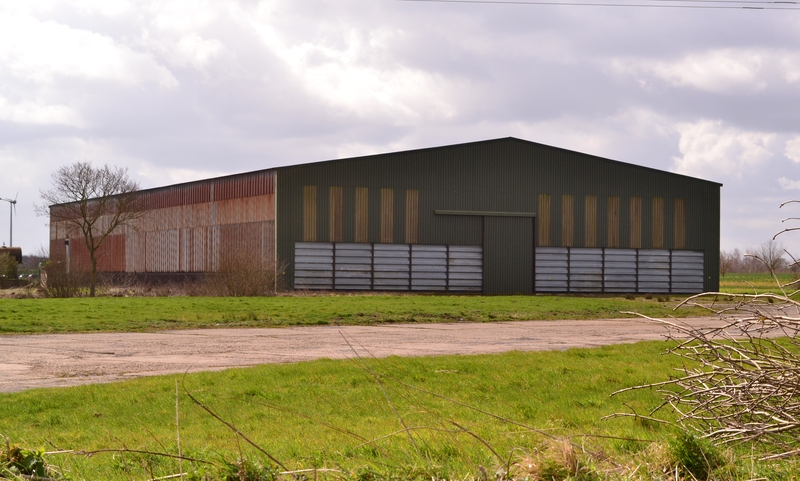 A blister hangar is also on site but thought not an original of Little Snoring. An air-raid shelter protected the personnel from attack. The bomb site is a field, and all but a small part of the runways are gone or at best farm tracks. 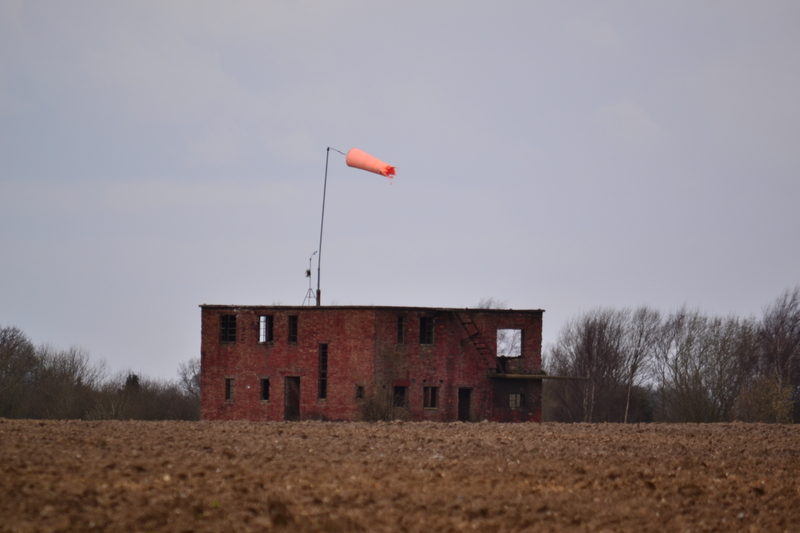 Little Snoring’s gem is its watch office, standing proud in the centre of the site, a lone wind sock fluttering from its walls. Run down and dilapidated, it is crying out for love and restoration, but I suspect this isn’t going to happen and perhaps its days are very sadly numbered. During its operational life, twelve Lancasters and forty-three Mosquitos were lost during missions over enemy territory and to date no ‘official’ memorial exists in their honour. Maybe one day this too will change. The base commander, ‘glass eyed’ Group Captain Rex O’Bryan Hoare (Sammy) was a known character and has been mentioned in a number of books discussing night intruder missions. He was a very successful Mosquito pilot and looked up to by his fellow pilots. A superbly detailed account of him appears here and is certainly worth a read. 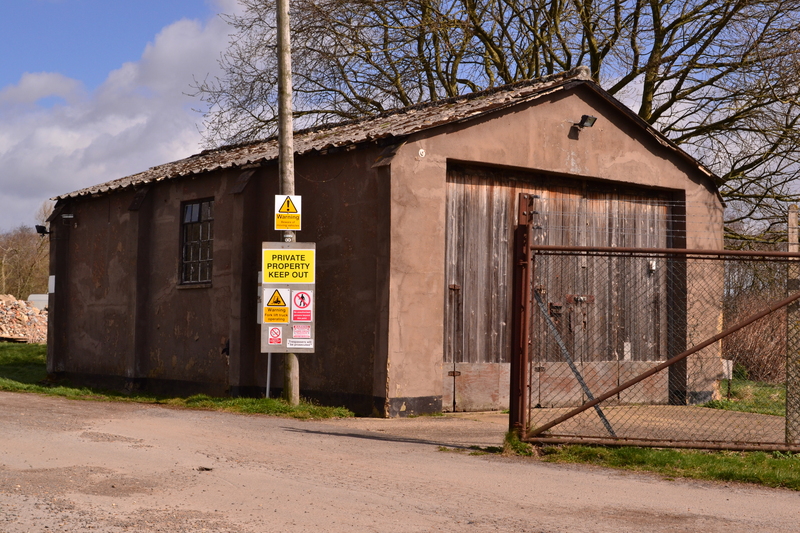 A once bustling airfield, Little Snoring is now a sleepy site with a few remaining remnants of its wartime activity. The church boards reminders of its successes and the toll paid by the young men of the Royal Air Force. The watch office now derelict and forlorn. The four award and honours boards in St. Andrew’s Church can be seen by clicking here. *2 There is a 100 Group Association that keeps the memories of 100 group alive. A number of Veterans from the group meet for reunions, coming from all over the world. A website is available. 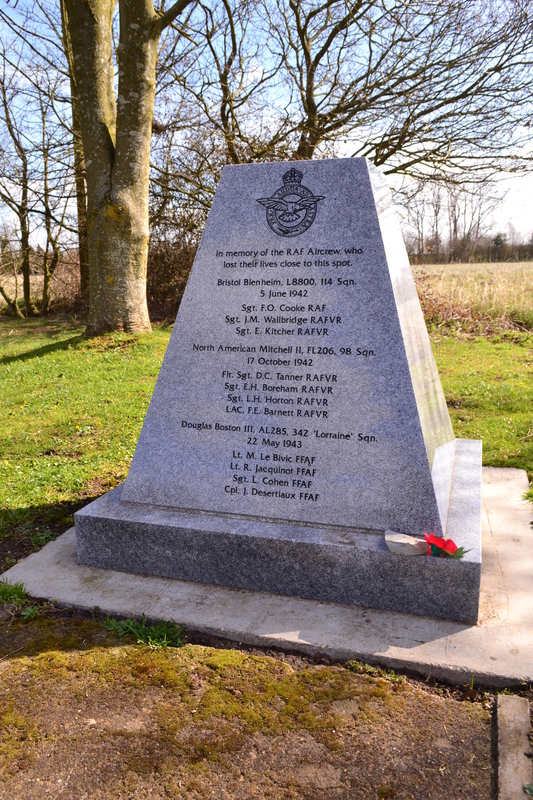 For more personal stories about 23 Squadron at RAF Little Snoring, visit Pierre Lagace’s blog at RAF 23 Squadron. Janine Harrington, secretary for the Association, writes her own books based around 100 Group, read it through her blog. Janine’s writings are inspired by her mother’s story of her wartime fiance Vic Vinnell of 192 Squadron at Foulsham, who, together with Canadian pilot Jack Fisher never returned from a secret operation on the night of 26th / 27th November 1944.